In a revealing document submitted to the U.S. Copyright Royalty Board (CRB), Pandora argues for lowered music licensing rates in the 2016-2020 statutory royalty period. The proposed rate range is about half the amount suggested by SoundExchange in its submission to the CRB. (See David Oxenford’s coverage here.) In its argument Pandora discloses aspects of its privately negotiated licensing agreement with indie-label coalition Merlin Network (RAIN coverage here). In its submission to the CRB, Pandora argues for new rates within a range of $0.00110 to $0.00129. Note that the high end of that range, which would apply to 2020, is a micro-penny less than Pandora’s current (2014) rate. The CRB submission from SoundExchange (the organization which collects and distributes streaming royalties for labels and artists) proposes higher rates in a range of $0.0025 to $0.0029. Pandora’s rationale for lowering the cost of music is extremely interesting for what it reveals about its private licensing deal with the Merlin Network, a coalition of 20,000 record labels around the world. In aggregate, Merlin could be considered a “major” — it claims that music on its member labels was streamed 1.4-billion times across all online music services in April. Pandora’s bespoke licensing agreement with Merlin is its first private licensing arrangement. The CRB should be guided by free-market agreements between willing buyers and willing sellers. Such agreements are hard to find, since nearly all Internet radio acquires music rights via the statutory rate. 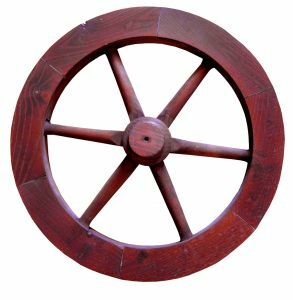 Therefore, Pandora is supplying a freshly minted, free-market deal case as a template that should guide the Copyright Royalty Board toward lowering the statutory rates. The most remarkable aspect of Pandora’s CRB submission is its detail of the Merlin agreement, regarding a way in which Pandora will favor Merlin labels and artists. Redacted portions of the CRB submission are blacked out in the public version of the document. 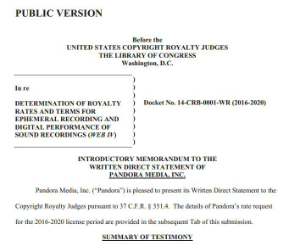 It is clear from context that Pandora divulges royalty rates to the CRB. Later in the document, Pandora states that it has experimented with “steering” in the pre-Merlin past, and has been steering playlists toward Merlin music during the short life of the agreement (since August). The number of Merlin streams during that period, as a percentage of major-label streams, is indicated in the CRB document, but redacted from the public version. We and our Artists are being SCREWED by Pandora, Spotify and Sound Exchange. Pandora of course has no illusion of lowering their royalties, rather, this is posturing in an attempt to minimize the coming increase. The fascinating byproduct of their argument is the news; the revelation that they deliberately manipulate their song generation algorithm for corporate advantage. In a nutshell it means that Pandora does not provide the best user experience that it is capable of providing. This is profound, and may damage Pandora’s credibility towards its users.